Practice the art of luxurious living to remind yourself that you’re richly blessed, regardless of your bank account. 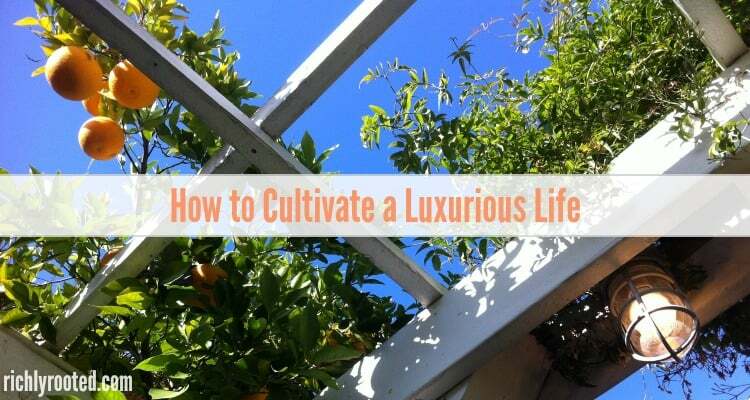 Here’s how to cultivate luxury in your everyday life! Remember how I chose less? I said “no” to a crazy busy, climb-the-ladder, never settle, achieve-wealth-and-fame life. But forgoing “Success” as the world defines it doesn’t mean giving up happiness–or even luxury. A week ago as I relaxed in a hot, fragrant bath by candlelight I thought “this is luxury.” And it was, even though it was practically free. All my life I’ve had a proclivity for luxurious experiences, and I’ve done my best to create them for myself–or fully appreciate them when others supplied the experience. You see, luxury isn’t necessarily something you’re born into or need to buy. As long as you’re defining it properly, you can experience it on any income and in any corner of the world. Luxury isn’t necessary to life, but it’s something that can increase your comfort and remind you that life encompasses more than mere day-t0-day survival. Practice the art of luxurious living to remind yourself that you’re richly blessed, regardless of your bank account. Increasing the caliber of the things you buy and surround yourself with gives you a daily experience of luxury. Now, this definitely doesn’t mean that you have to spend more money than you used to! A homemade, silky-smooth almond custard is a much more luxurious dessert than instant pudding, yet the former costs less to make. When you visit the grocery store, pick up basic, natural ingredients instead of processed foods, and craft your own meals from scratch. When you do your thrift-store clothes shopping, check labels for natural materials like wool and cotton, which are often better quality. Instead of two or three cheap, fast-fashion pairs of shoes, save up for one nice pair of shoes that will last longer, look better, and feel more comfortable. Granted, it takes some time and even research to recognise quality. At least it did for me! I had to learn about brands and materials and ingredients, and be willing to shop around for the good stuff rather than make impulse buys. Have you ever seen a character in a movie (or in real life) who gets to have an extravagant experience and they just seem…bored? Or maybe you’ve witnessed this nonchalance closer to home. 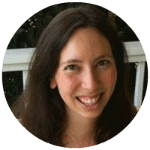 You reveal a special surprise to your kids, only to have the excitement of one quelled by the more cynical child declaring “that’s not that special.” As a teacher, I often witnessed how the value of an experience or treat was determined by the attitude of the recipients. If you feel like life’s luxuries are few and far between, maybe it’s because you’re not attentive to them. Train yourself to notice and relish the special touches that life or other people give you. Don’t be the person who isn’t moved by an exquisite view or excited by a glass of champagne. There are countless ways to make mundane days special and memorable. Are there flowers blooming outside? Bring an armful indoors and spread them through your house in vases and jars and pitchers. Do you own a bed sheet? Spread it in the yard (or park) and eat your meal in the open air, under a noonday sun or a rosy sunset. Are you going to sit down at any point after supper? Prepare a quick foot bath and soak your feet while you read or watch TV or whatever you normally do! 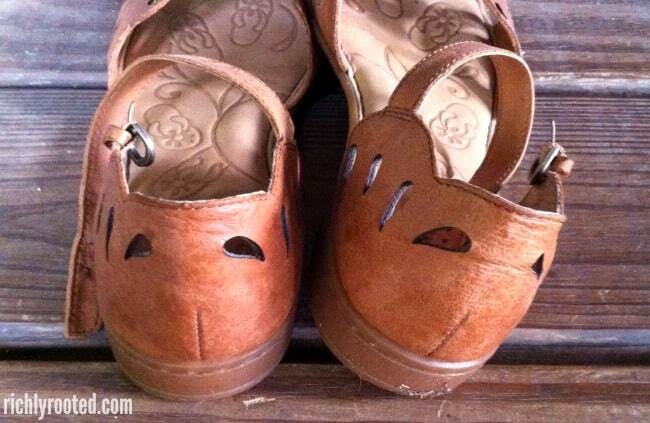 Of course, don’t wear yourself out attempting to inject “something extra” into everything you do. This isn’t about making every experience worthy of a manicured Instagram shot. The point is to slow down and indulge in caring more for yourself and your family, rather than traveling through life in rut that only sees the next “to do” on the agenda. Think about diamonds: they’re often displayed on a plain black background, because this sets off the jewel and draws your attention to it. You’ll get much better at noticing, appreciating, and taking advantage of luxury if you simplify the backdrop of your own life. 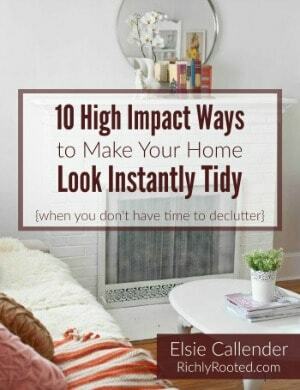 Get rid of clutter in your house. (My handbook can help you with that!) Streamline your life and daily activities. Determine your priorities and goals and be more focused in your pursuit of them. If you trim the excess you can make more time for the things you love. The next time you’re pining over a little more cushion in your bank account, remember that you have a choice. Life is full of luxury, and sometimes all it takes to experience it is deciding to soak in a hot bath. What are your favourite luxuries, large or small? 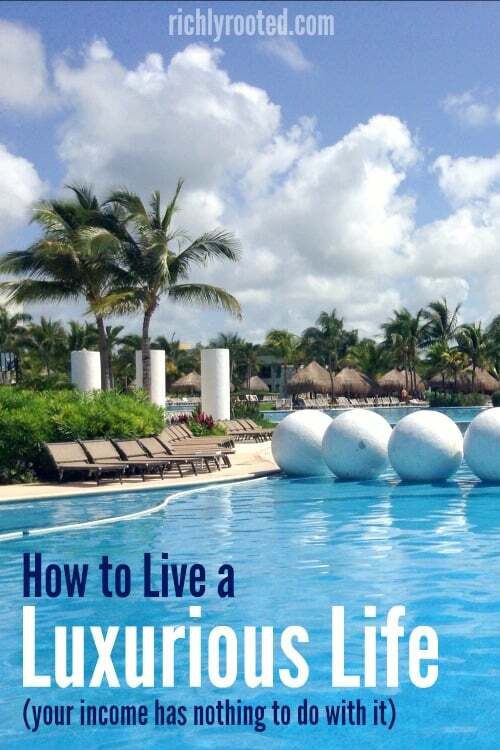 How are you crafting a luxurious life? P.S. 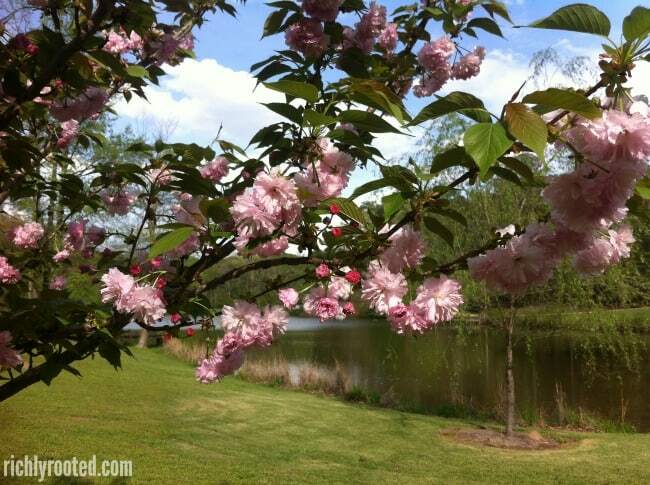 You might also enjoy this post on 7 Simple Ways to Live More Abundantly, Right Now. Next Post » Essential Oils, Simplified.